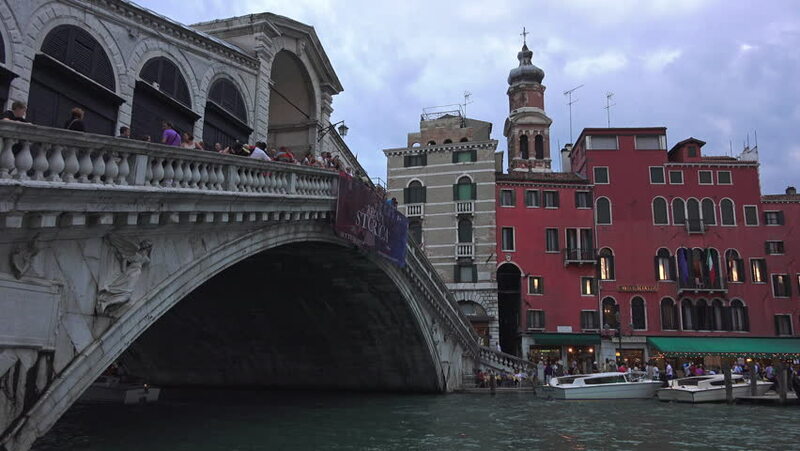 VENICE, ITALY - SEPT 2014: Venice Italy Rialto Bridge vaporetto evening 4k. Travel vacation destination by air, cruise ship. World Heritage Site. Grand Canal and famous Rialto Bridge with vaporetto. 4k00:21VENICE, ITALY - SEPT 2014: Venice Italy Rialto Bridge vaporetto evening fast timelapse. Major travel vacation destination by air and cruise ship. Grand Canal, famous Rialto Bridge water transport. 4k00:27VENICE, ITALY - SEPT 2014: Venice Italy Rialto Bridge water taxi crowd. Major travel destination by air and cruise ship. World Heritage Site. Restaurants and business line shore of shore. 4k00:27VENICE, ITALY - SEPT 2014: Venice Italy Rialto Bridge water taxi crowd. Major travel vacation destination by air and cruise ship. World Heritage Site. Grand Canal, famous Rialto Bridge vaporetto taxi. 4k00:09VENICE, ITALY - SEPT 2014: Venice Italy Grand Canal Rialto Bridge crowded boats. Major travel destination by air and cruise ship. World Heritage Site. Tourists fill the city from all over the world. 4k00:23VENICE, ITALY - SEPT 2014: Venice Italy Grand Canal Rialto Bridge crowded boats fast motion timelapse. Major travel vacation destination by air and cruise ship. Listed as a World Heritage Site. 4k00:23VENICE, ITALY - SEPT 2014: Venice Italy Grand Canal Rialto Bridge crowded boats fast timelapse 4k. Major travel vacation destination by air and cruise ship. Grand Canal and famous Rialto Bridge. 4k00:30VENICE, ITALY - SEPT 2014: Venice Italy Grand Canal Rialto Bridge gondola 4k. Travel destination air and cruise ships. Grand Canal and famous Rialto Bridge, vaporetto departing arriving loading dock.